A review of some events from the past week unrelated to drugs and elites and former TV celebs on public teats. Early in the week, Tom Adams' site entered it's 5th year. His observations have, unfortunately, never been more necessary. Hopefully Adams is receptive to a cry of "4 more years!" Politically, NDP "Leader" Andrea Horwath announced she would continue to support the Ontario Liberal government. All rookie leaders in Ontario tend to have dissappointing first election campaigns, but Horwath has, in my view, distinguished herself in increasingly demonstrating she feels an incompetent Liberal government superior to one she would lead. After 4 years of pain since the foolish Smitherman/McGuinty policies were introduced to Ontario's electricity sector in the form of the Green Energy Act, we look set for two more years of pain, unless the NDP is able to dispose of it's "leader." 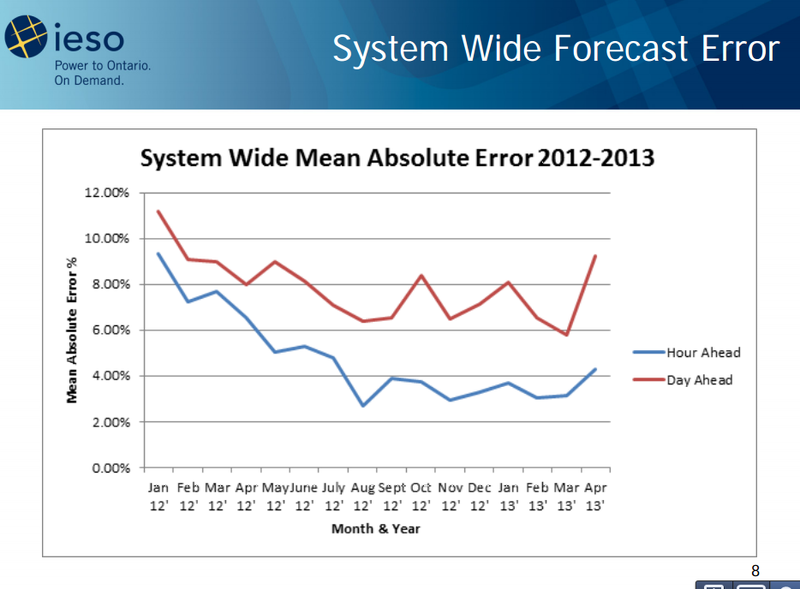 Forecasting for embedded variable resources will be developed by Q3 2013. Additionally, RII [Renewable Integration Initiative] will facilitate the dispatching of variable generation, with implementation set for September 2013. Variable generation dispatch will allow for greater flexibility and help alleviate surplus baseload generation concerns. Alleviating the IESO's "concerns" isn't related to controlling costs, or stopping the growth of the SBG problem. 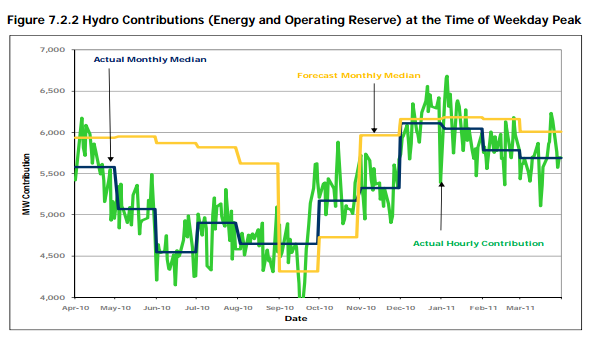 To emphasize the issue, the night before the IESO released the forecast, Ontario experienced a scenario where baseload generation was going to exceed possible demand (internal and export) for most of the next day (which was leading into a long-weekend in the U.S.). At 8 pm Thursday night, the expectation was that we'd give the Americans free supply on Friday. Presumably to avoid that embarassment, Pickering's unit 4 and Bruce's unit 3 were taken offline overnight. there have been three nuclear shutdowns in 2013 year to date due to SBG events as opposed to one shutdown in 2012. The total loss in nuclear energy due to SBG as of May 15, 2013 is 310 GWh compared to 106 GWh for the same timeframe in 2012. These are problems for ratepayers burdened by paying producers not to produce, but perhaps not for the IESO. 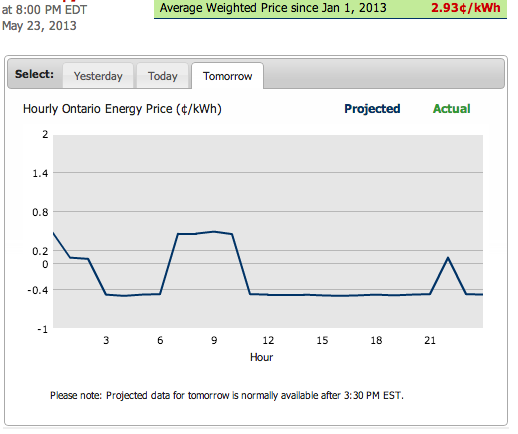 By the end of Friday, the inability to forecast supply and demand (the IESO no longer really reports on either - and it's not clear that they know that) presented itself another way - with 2 reactors taken offline, the Hourly Ontario Energy Price spiked to $510.98 in hour 21. The wind forecast from hour 20 was for wind generation of 392MW (24 hours earlier the forecast was for 668MW). but the actual output was only 285MW - demand also shows as well above the forecast; so the price spike is the expected result of over-estimating supply and under-estimating demand. Not that these are easy tasks, but it's notable that the IESO does not appear to be getting better at performing them; presentations dated during this week indicate the accuracy did improve during the first 8 months of central forecasting after a January 2012 start-up, but the performance has since been stagnant. That performance level is measured as the forcast production less the actual, divided by the total capacity; when the price spiked Friday night this measurement the IESO uses was within target, so it's a metric of dubious value; it's worth noting that if renewable do grow to ~10000MW, the hour ahead average error, thus measured, is hoped to be 4.5% (the equivalent of a Pickering unit cutting out every hour), while the day ahead hope is for 9% (a Darlington unit cutting out every day). Spastic pricing and expensive curtailment are characteristics continuing to be designed into Ontario's system. The IESO outlook addresses the low hydro output levels. A topic I've tried to introduce on this blog, and in the Financial Post, is the negative impact Ontario's policies have had on hyroelectiric generation output, and the pricing received for that output by the public generator. 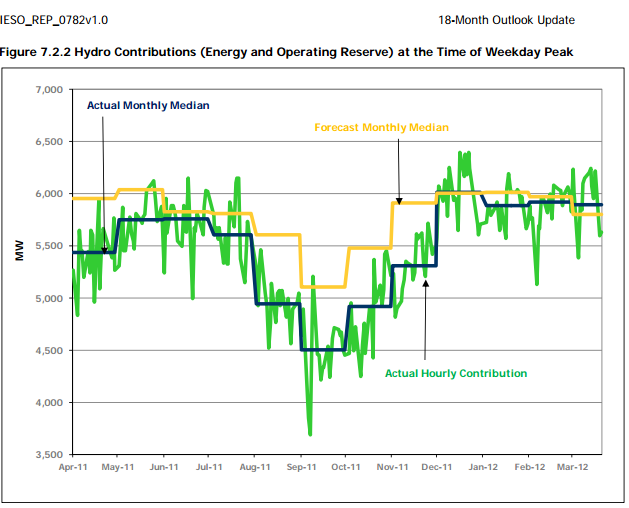 The forecasted monthly is typically the median contribution of hydroelectric energy at the time of weekday peak since 2002. However, if low water persists, the forecast is adjusted accordingly to reflect the observed trend. 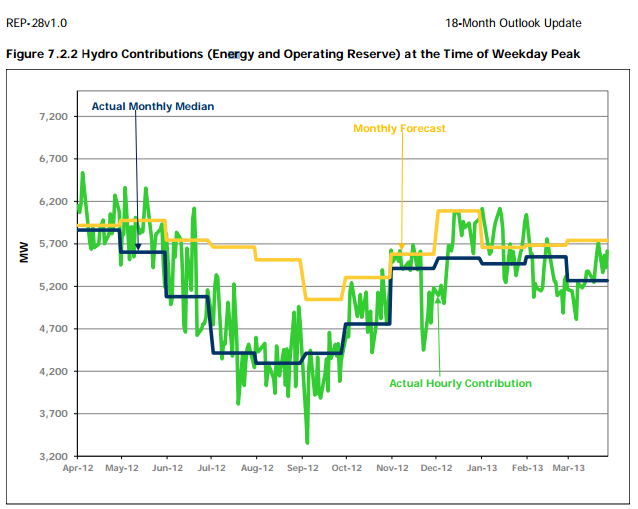 "Figure 7.2.2 Hydro Contributions (Energy and Operating Reserve) at the Time of Weekday Peak"
the human being. I believe my exact words were "I don't want to be your dirty little secret. Theme Format: It is almost like standard format of the pub quiz.